Recent estimates of the U.S. economic gains that would result from the proposed Trans-Pacific Partnership (TPP) are very small -- only 0.13 percent of GDP by 2025. 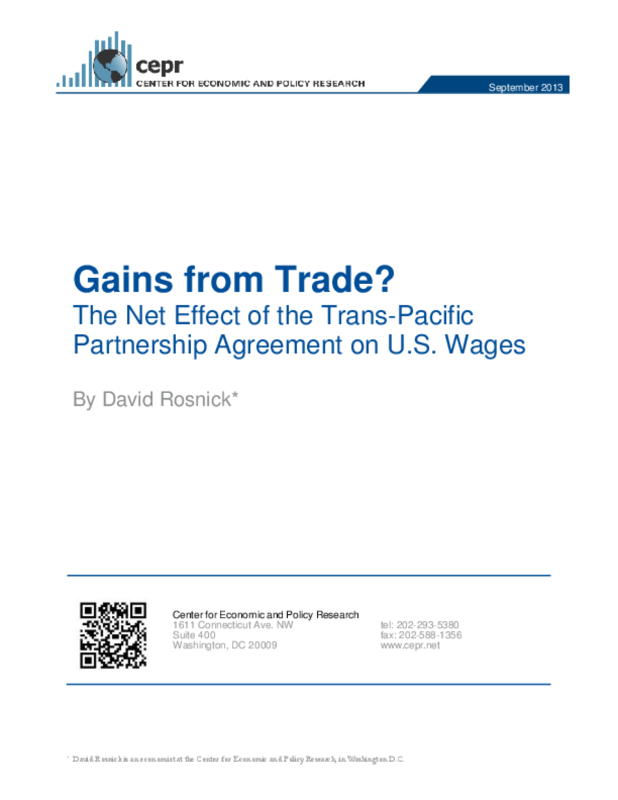 Taking into account the un-equalizing effect of trade on wages, this paper finds the median wage earner will probably lose as a result of any such agreement. In fact, most workers are likely to lose -- the exceptions being some of the bottom quarter or so whose earnings are determined by the minimum wage; and those with the highest wages who are more protected from international competition. Rather, many top incomes will rise as a result of TPP expansion of the terms and enforcement of copyrights and patents. The long-term losses, going forward over the same period (to 2025), from the failure to restore full employment to the United States have been some 25 times greater than the potential gains of the TPP, and more than five times as large as the possible gains resulting from a much broader trade agenda. Trade and Jobs: Can We Trust the Models?